Within the Helping Professions I include the following: Social Workers, Housing Officers, Police Officers, Teachers, Noise Team officers and any agency officers that may be drawn into disputes between members of the public through their role. Sometimes a dispute can start to involve the Helping Professional and their organisation directly. Often this is made more likely by the type of responses given to the members of the public who have contacted them because the responses have not been genuinely impartial and have been manifestations of the Rescuer Syndrome on a personal level by the responding professional. This will often have been reinforced by the Rescuer Syndrome being encouraged through the organisation's procedures and 'mind-set'. Many who work in the Helping Professions talk of the stress of dealing with others' day to day problems and often the most stressful situations are those they can't 'solve' and yet may seem trivial. These are the situations that tend to become chronic and long term. The Guide to the Principles of Effective Communication and Conflict Resolution e-book based on the Principles described on this site. An explanation of each Principle with exercises to practice in your own time in order to develop greater awareness and effectiveness in your communication and responses to conflict. Click here for further details. In almost all of these situations the very reason they have become entrenched and long term and chronic is because the response to the individuals involved has been one of trying to solve their problem for them. In almost all of these situations they are completely outside of the remit of the Helping Profession that has been contacted and yet this has not been clarified with those who have the difficulties. As a result, a false expectation has been (self) created by the agency through the responses of the Helping Professional representing them that they can solve the problem. In such cases it may often be that the member of the public seeking help is seen as 'incapable' or 'a pain' or a constant complainer. Zen in the Art of Helping (Arkana) is an excellent book which is a deep personal exploration of the challenges involved in working in the Helping Professions, drawing upon Buddhist insights to reflect upon the experience. Often the Helping Professional does not recognise that their own contribution has been a major cause of the situation becoming chronic. This is one of the ways in which the Rescuer Syndrome has been manifested and various of the aspects of Effective Communication and Conflict Resolution described on this site have not been practiced or taken into consideration. This is not a criticism of any individual that responds in this way. They are often expected to do so by the agency or organisation they work for through various procedures and structures that allow an easy blurring of the boundaries to what the agency is responsible for. One example is the kind of customer service requirement that effectively states 'If we can't find the answer for you immediately we will direct you to someone who can.' The caveat to this that says '.......and that person may sometimes be YOU!' is rarely stated and so the build up of expectation that the Police, the Local Authority, the Social Work team, the School Teachers and other staff etc. are responsible for finding a solution to any problem brought to their attention is created. A tenant calls a Housing Officer to say they are having difficulties with their neighbour over the behaviour of the neighbour’s children. On investigation it is found that no aspect of the Tenancy Agreement has been breached and there are no other forms of legislation found to be broken, and so the organisation’s responsibility to intervene officially ends. However, there may be a wish to be supportive of the parties involved to some extent but it is important that this does not lead to partial actions for, or against, either party. This risks the complainant feeling their complaint is being belittled or that the responding officer is not taking them seriously and is ‘taking the side’ of the neighbour against them by ‘explaining away’ the thing they are complaining about. The temptation to do this can arise from a personal desire on the part of the Housing Officer to placate the person or try to ‘smooth things over’, but in doing so there is a risk of antagonising the situation and causing a reaction to the officer and hence the organisation. In this way the officer and the organisation become part of the dispute. By giving an opinion or making a suggestion or giving advice, they are implying that an element of ownership of the situation lies with them. When it doesn't. It is important therefore that an awareness of impartiality runs through all dealings by the organisation’s representatives, even, or perhaps, particularly where there is no evidence of a breach of Tenancy Agreement. This is analogous to situations encountered in all of the Helping Professions where a response intended to 'solve' the problem actually leads to the agency or organisation becoming part of the problem. The very act of trying to solve it implies to the member of the public bringing the problem to the agency that it is now the agency's responsibility, as they have already started to create answers. - The Simple, Effective Skills of Conflict Resolution. 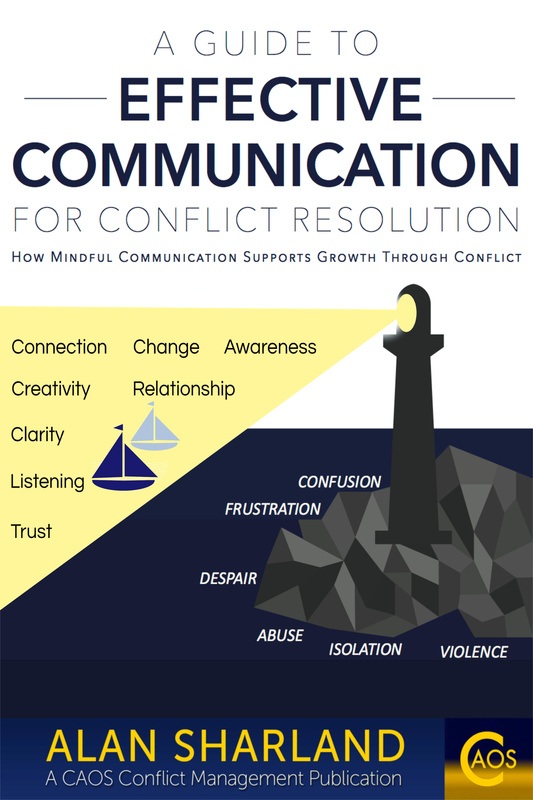 Click here to find out more about this e-booklet from Communication and Conflict. Instead of advising people what to do about such problems, for example, ‘You could try going out when the children are playing.’ or giving opinions: ‘It will probably all blow over when the days draw in, it’s just summer liveliness’, the responses can be geared more towards the party engaging in resolving the situation themselves. Clarifying that the situation is not deemed to be a breach of Tenancy (in the above example)or other legislation and that no action will be taken, to assert the organisation’s position on the situation. This establishes that responsibility for resolving the situation lies with the parties concerned. Informing the party or parties that mediation is available to them (if it is!) to try to resolve the situation if they wish to try this. If they do not wish to try it, a re-assertion that the organisation does not have a role to play in resolving the situation as no evidence of tenancy breach is present. What is it about the children’s behaviour that upsets you? What communication have you had with your neighbour about it? Note: This is not the same as ‘Have you tried speaking to your neighbour?’ which is basically a suggestion or advice and risks giving a sense of partiality to the person complaining. It is also prone to receiving a response such as ‘You can’t talk to them I’ve tried and they are just rude’ etc. leading to another dead end and the likelihood that the respondent will be awaiting another 'clever idea' from the Helping Professional rather than looking to themselves for answers. Also note that the important difference between the questions is that the impartial ones are open questions, while the partial ones are closed questions. What would you see as a way for the situation to change? All of these questions aim to begin a process through which the party can review what is happening and how it is affecting them and what they would like to change. It is important that at any time the answers are a request or demand for the organisation or agency to take action it is re-emphasised that there is no basis for this and that to do so would be inappropriate. This reinforces the point that the responsibility for resolving the situation lies with the party / parties themselves. While there is no guarantee that the questions above are going to leave the party satisfied, they are at no point trying to take ownership of the problem away from them, which is necessary and appropriate given that the organisation has no role to play in it. Advice such as ‘Have you tried speaking to the party?’ implies that the officer responding is trying to provide answers to the problem as if they are responsible for resolving it, which is unnecessary and inappropriate. They are increasing the likelihood of those involved developing an unnecessary and inappropriate dependence on the Helping Profession contacted. Is that being supportive and caring? They are at risk of acting in a way that is entirely inappropriate, and possibly beyond their powers, in which case there may be legal implications. They are at risk of escalating the dispute by 'upping the ante' if they do anything that is partial and in favour of one party - and therefore against the other party - where there is no legal basis to do so. They are using resources allocated for use in situations defined by the legislation and other procedures relevant to their role, for situations that are not within that definition. Hence they are wasting resources which should be focused on more serious situations, ie. those that their role requires them to act in. They are effectively creating a precedent to act in any situation. No wonder they are stressed out! The use of summaries of what a party has said provide an acknowledgement of their concerns - as long as the summary does not include opinions about what they have said. This simply acknowledges that the officer has heard the concerns of the tenant but has not expressed an opinion such as ‘mmmm that sounds a bit worrying’or solutions such as ‘Perhaps there’s a different way they can get through to get to the ball?’. There will rarely be any possibility of effective conflict resolution. There will always be an extremely high level of stress amongst those Helping Professionals. There will be a very large drain on the agency's resources - both material and human. Awareness of both the organisation's boundaries and the Helping Professional's personal boundaries combine to provide an effective response to those who have difficulties that are not within the remit of the agency. This sort of sounds obvious, but the lack of clarity over these boundaries is an enormous source of stress and wasted resources within the Helping Professions and a major cause of unnecessary dependence by members of the public on agencies to resolve their personal disputes for them. Something they will never be able to do.